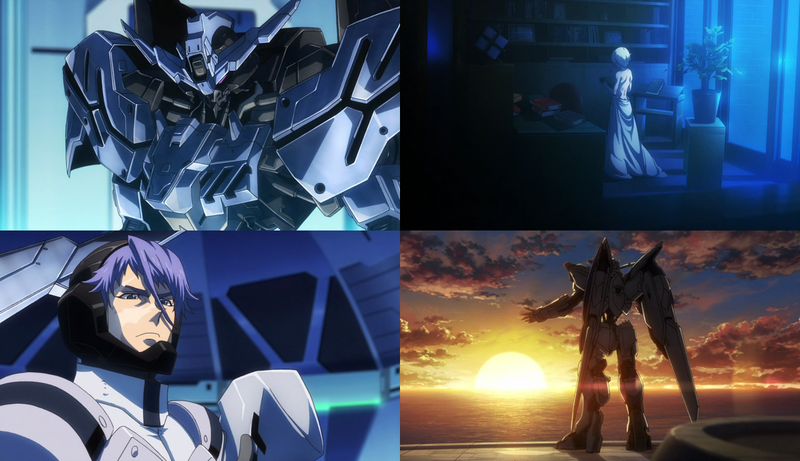 So Macky’s plan to seize Gjallarhorn’s HQ goes off without much of a hitch, with the help of Mika and Barbatos Lupus-Rex-Ou-Rey-Roi-King. It has been a long time coming, and this episode doesn’t mince about delaying his movement too much, not only in his coup but also in FINALLY revealing his past. It is as dark as you would expect given his chibi-self’s dourness and implications of abuse. In the latter’s case, boy he has had a lot. There is no innocent, young, rogue in Macky’s past who was slowly driven to the dark side, but somebody who was already there and just moved deeper and deeper into it as time went on. One would wonder if it wasn’t for their friendship with each other, Orga and Mika would have ended up the same if they were on their own. However, this question is neither here nor there in the long run, since we are at the beginning of endgame, and they are where they are, and Macky is where he is. It’s not exactly the most original out there (I was thinking of Griffith throughout his flashback), but it is effective, and very welcome that we now know what makes Macky tick. What makes this episode all the more great in the Revelation Department (Just past the Epiphany Kiosk to the right of the Moment of Clarity Dressing Room), is how they also finally get around to Galli-Galli unmasking. Suffice to say it is kinda disappointing, you would think with a mask like that his facial scars would be horrific, but no it’s kindof a standard burn scars across the face. It’s not as a bad as even Mr. Bushido’s scars and he had the temerity to show most of his face regardless. On the other hand, we get some new resolve in him, as he sees once and for all what Macky is after and reconciles a relationship where he tried so hard to go after him, but Macky was already lost by then. Blah, blah, tragic etc, but now both masks are literally off on them, so there is nowhere to go but down. Nowhere to go but down? Yeah, for at this point I will be surprised if this series has a bright ending compared to the first season. Battlelines are further drawn with everybody in their places, and we now know much more than we needed about the Alaya-Vijyana System and its variants. If you thought tethering yourself to some nondescript system is bad, you haven’t seen anything else yet, because both the Vidar Gundam and the new Gundam Bael (a very ominous looking Gundam despite the white colour scheme), have their Faux-Alaya-Vijyana systems based on two particular people’s brains: Ein for the former, and the mysterious Agnika Kaieru in the latter. Whether or not pushing those systems (even if they imply it won’t happen) to the limit will cause Galli-Galli and Macky to end up like Mika did, but we shall see. And that’s all we can do right now. Bloody Almiria in the next episode preview. Dat don’t look good. Errything don’t look good, period. I mean quality-wise yeah the show’s still great, but for erryboddy in the show? Eeeeeeeeeeeeh.